Given the thousands of stars recently discovered having planets, it is realistically possible that advanced alien intelligence might well be watching our barbaric, primitive little race of beings. I wonder what they think of our one-dimensional political concept. Are they splitting a gut laughing at how we insist on putting the entire scope of planetary cooperation and governance on a finite line segment with only two possible diametrically opposed models? Are they amused or disgusted that, on our planet, all possible paradigms of political or philosophical thinking MUST fit on either end of that line segment: one must be either liberal or conservative, left or right, respectively–or somewhere in between using the mid-way point as a reference. 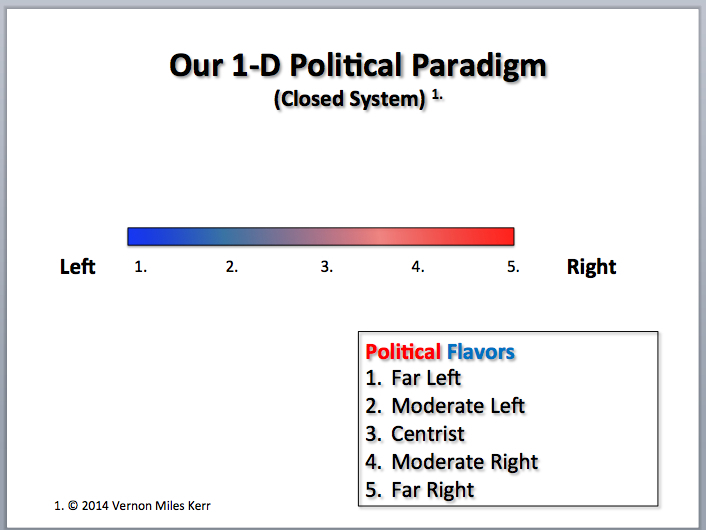 Thus, “left of center” or “right of center” can be added to the scale, bringing the total possible flavors of political classification to five. On our little planet, no one ever questions the assumption that all modes of human governance and collaboration can be described as being somewhere along that simple one-dimensional, bi-polar, finite scale. it would potentially add even more by having an open system where line segments join those intermediate points across the center of the triangle. 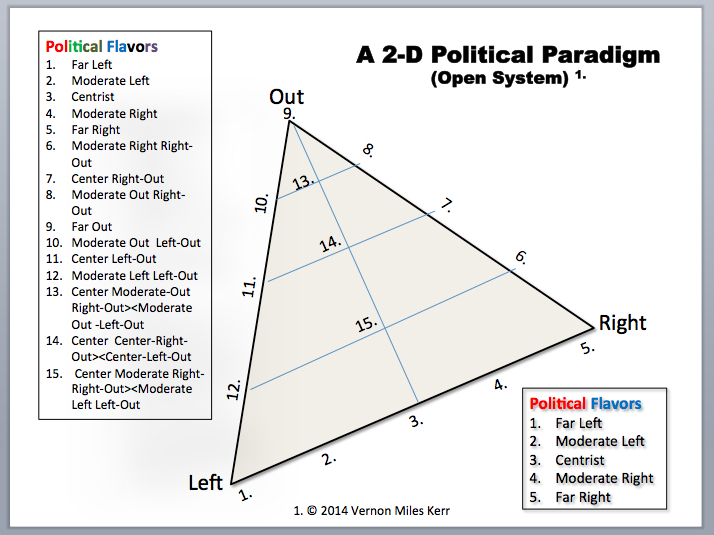 Projecting that into the three dimensional, fourpoint tetrahedron with all intermediate points connecting across the center of the three-dimensional model would indeed add a subtlety to theories of governance that even Einstein might have trouble understanding. And, that is exactly the point. 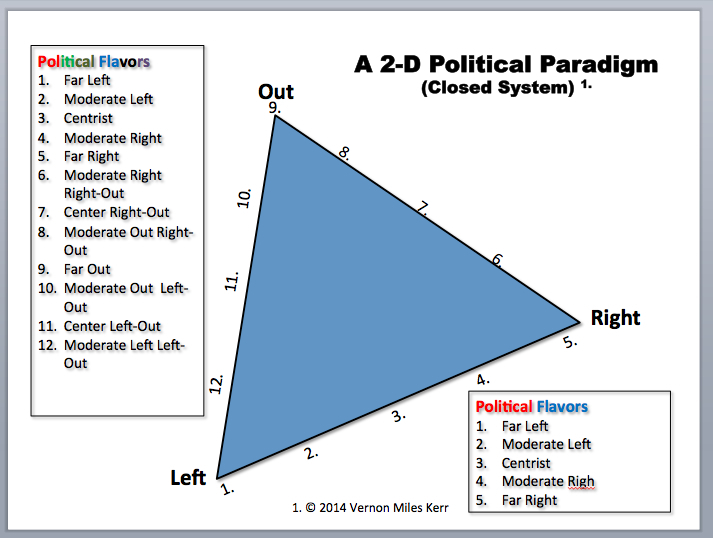 Our one-dimensional political paradigm functions as a political science tool for dummies. Even the most uneducated of us can understand juxtapositions like black-white, good-evil, communism-capitalism, wealthy-poor, patriot-traitor or labor-management and can easily pick a side then really get behind supporting that side and resisting the other with all of their energy and emotion–and life’s blood, if necessary. Those who control the masses of Earth, try to keep it simple. By using such an inane model they can create the illusion of choices. The masses only have to choose between two things, vanilla or chocolate. Or to be fair, the political thinkers in their magnanimity have allowed us to mix vanilla and chocolate and become half-and-half, chocolaty-vanilla or vanilla-y-chocolate as well. So what, if “transcendentalist” doesn’t exist? If we all take a stand, perhaps someday it will exist along with fifty or sixty other possibilities. Maybe those people from other planets will have a few ideas for us. Previous Post Rhetoric | What is Patriotism?